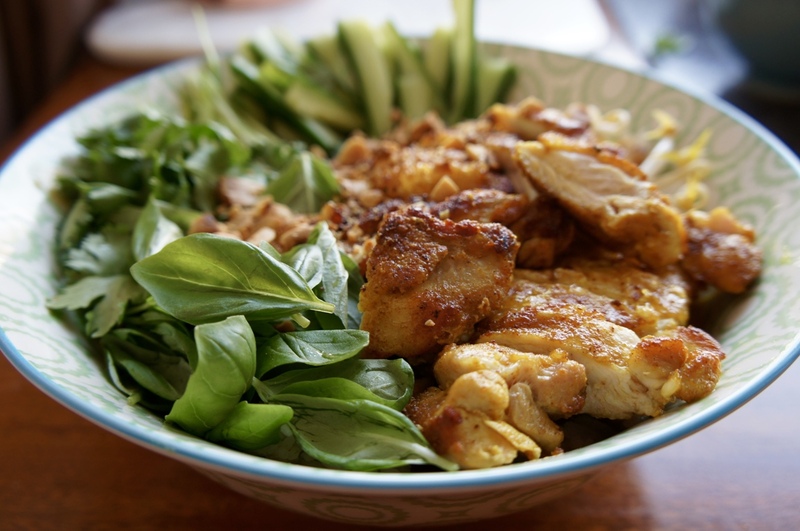 Surprisingly healthy, inCREDIBLY delicious and a bit different to your average weekday night supper, this Thai chicken satay rice bowl has become a home staple for me (I’ve even bought bowls especially for it). The first I knew of Gizzi Erskine was being cooked one of her dishes from Skinny Weeks & Weekend Feasts by my brother. Once I realised that the dish I was eating was from the ‘skinny weeks’ part of the recipe book , I knew we were going to get on just fine. It was not as you would imagine a ‘skinny’ recipe to be and was packed full of flavour, colour and felt delightfully indulgent. 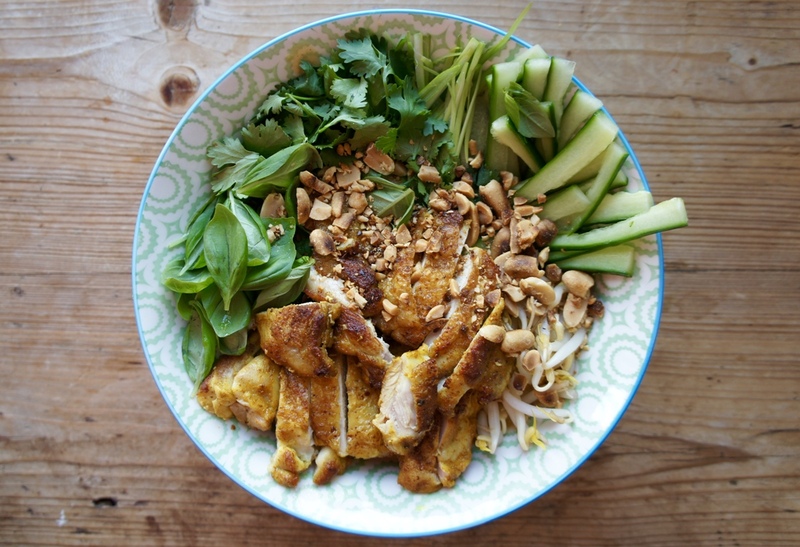 This Thai satay rice bowl is in the same vein. One of my favourite parts of this dish is the chicken. You can discard the skin if you so desire (weirdo) but the slightly curried skin turns into a magically crisp layer on what remains a seriously succulent and moist bit of chicken thigh. 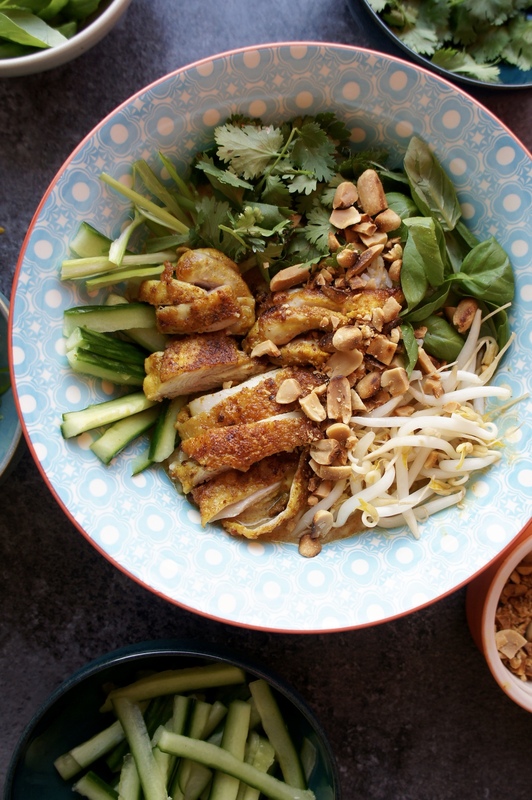 As soon as the chicken hits the satay rice bowl it is then impregnated with the peanutty, coconutty, yellow curry-ness and becomes EVEN more moist. If you’re lucky i’ll say it again. Moist. 1. CHICKEN: Trim your chicken thighs of any excess fat or skin [see this recipe for more detail on trimming]. Remove the bone if it hasn’t already been removed: take a sharp knife, and cut a few slices down the length of the bone and as close to its edge as you can get to it’s edge. Gently cut around the bone and knuckle, and underneath, until you can remove it without taking too much chicken thigh with it. 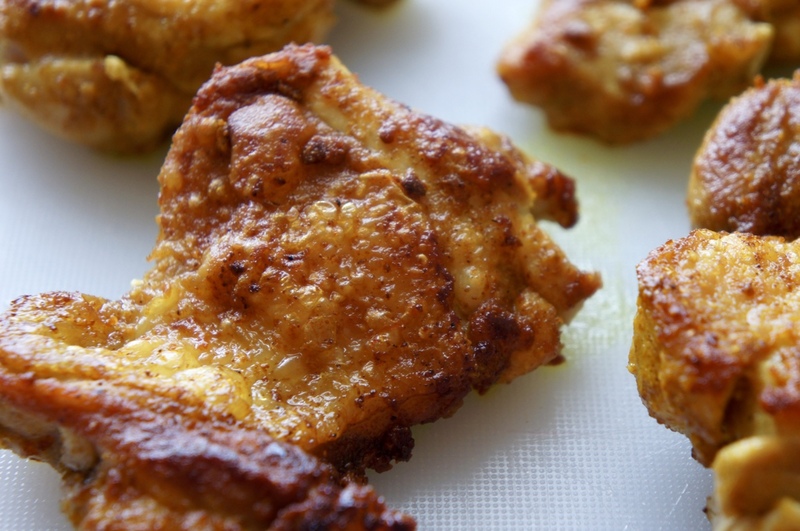 Lay the chicken thighs out on your chopping board and sprinkle with your sea salt and curry powder. Rub the thighs until it’s all evenly distributed. Drizzle on your 1 tsp olive oil and using your hands, lightly rub it on the thighs so they all have a light covering of olive oil. Set aside. 2. RICE: Put your rice in a small sauce pan and wash a few times. Add twice the amount of water as rice and put on a high heat (no stirring). Bubble for about 7 minutes until the water has just evaporated and you are left with holes in the top of the rice. Put a lid on, turn the heat to very low and leave for 5 minutes. Remove from the heat and keep the lid on for a bout 5 mins more. Test the rice – it should be lovely and fluffy. More details on this rice method here. 3. 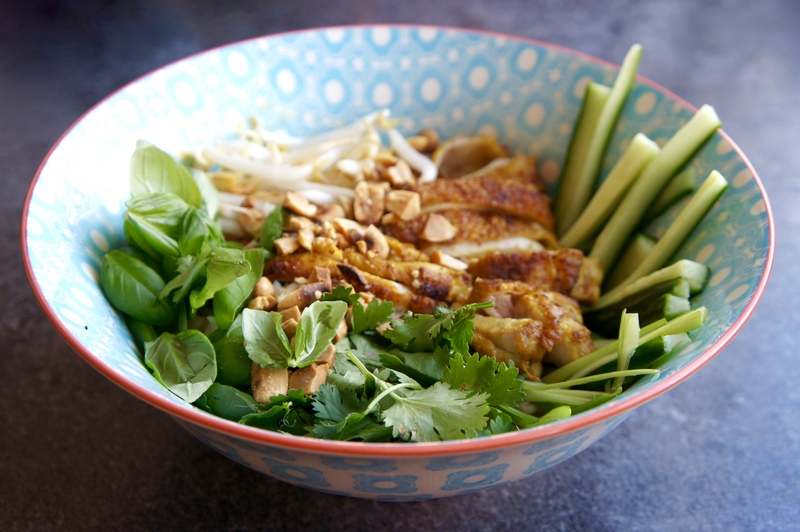 SAUCE: Have all your bits ready – measure the brown sugar, peanut butter & fish sauce into a little bowl, open the coconut milk tin and make your stock. Drizzle a little oil into the bottom of a medium – large saucepan over a medium / high heat. Add the curry paste and fry for 2 minutes. Pour in the coconut milk & chicken stock and mix (you may want to use a whisk). Add the peanut butter, brown sugar and fish sauce and stir. Bring it to the boil then turn down and simmer for 5 mins. Squeeze in the juice of one whole lime and mix. Keep it warm. 4. FRY THAT CHICKEN: Heat a griddle pan until smoking. Lay the chicken thighs skin side down onto the griddle pan, then lower the heat a bit. Fry for about 4-5 minutes (until the skin is lightly brown and crispy), then turn over and cook for another 4-5 minutes, until the chicken is cooked through. Remove the chicken from the pan and set aside to rest for a few minutes. Once it has rested and cooled a little, cut the thighs into thick slices, pouring any excess cooking juices into the curry sauce. 5. MAKE THE MAGIC: Make sure your veg is chopped, your herb leaves are picked and your peanuts have been toasted and chopped. 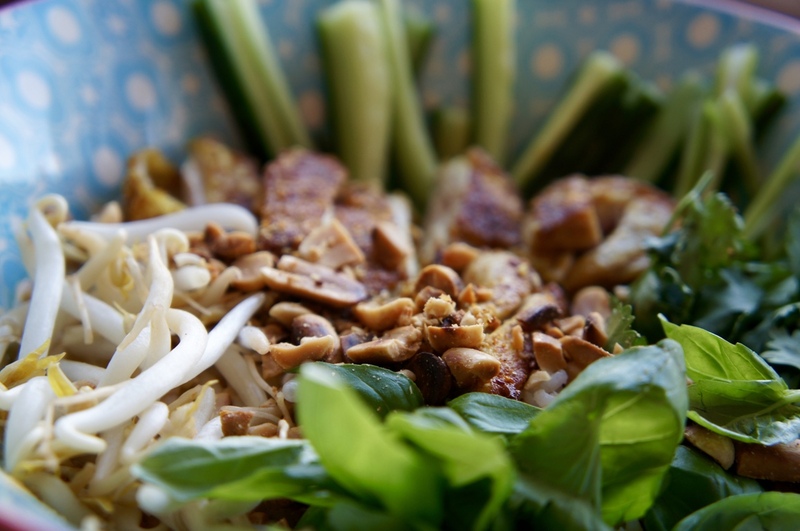 Divide the rice between bowls and top each with the sauce, chicken, cucumber matchsticks, spring onions matchsticks, handful of bean sprouts and peanuts. Scatter over the herbs and serve. Devour. This looks completely amazing. I’ve made similar curry before using the peanut butter in sauce but have never assembled dish this way. Very impressed and I will definitely have to try it. Thank you for your comment! It really is a delicious combination, so many textures and flavours. Let me know how you get on!